Its on LIVE on Quest on Channel 37 on Freeview and on Quest +1 Channel 38 on Freeview. I would think the qualifying will be taped and the quarters, semis and finals will be live. 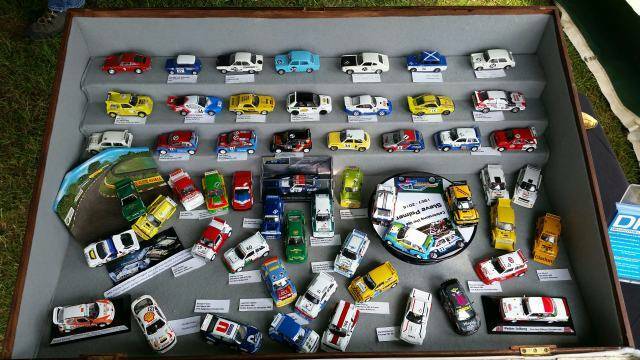 Our 'Steve' on the spot will be there displaying his rallycross models and I understand Dave Sims is also visiting. So hopefully some reports and photos please. Sadly my car is still in dock so not able to go this weekend. Came across on the TV very well. It did pick up that the 2017 event will be the 50th annivesary of the first Rallycross at Lydden Hill. So perhaps some more old cars will appear out of the woodwork? Hopefully by then my car might be working again so I can go!! Finished last week Petter Solberg’s rallycross VoIvo his first (and favourite) rallycross car. In 1995 he won 19 out of 21 races in the Norwegian RX championship in that car. He was shocked and surprised to see the model and asked me to make a model for him. Nice one. Looks a cracker! The model is all down Steves work and enthusiasm. I have just posted the photo for him, as he has two left hands when he is not building models!!! In which case, "top work Steve!!" Not sure what happened with the earlier post. It was the first time I'd posted from my smart phone, and the last by the looks of it! Many thanks to Chris for posting my pictures. One day, one day! I have got to a point that I can't display all of my rallycross models in one box, so have to pick and choose which ones to leave behind. The photo is as the display was on Sunday. On Saturday, a knowledgeable chappie was talking with me about the models and the cars themselves, and told me there was a model missing. The yellow and white Renault 5 of Roger Newbould. I'm not sure he believed me when I informed him I'd built one and it was at home, so brought it with me on Sunday. Don't know if he saw it, but he'd been Roger's mechanic for two years, working on the Renault!! Met with Steve Palmer's brother-in-law who was very taken that I (and Simon) had built Steve's cars (well, three of the six liveries to date between us) and took several shots of the Steve Palmer Tribute turntable to show his sister, Steve's widow. Put a lump in my thoat, that did! 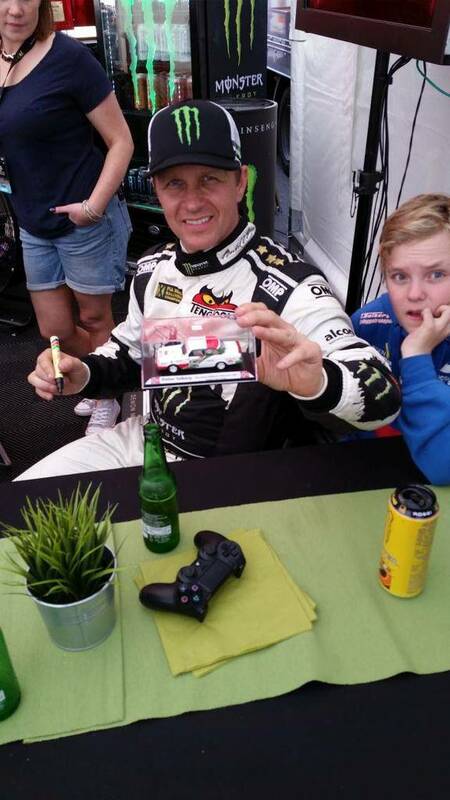 Other highlights include meeting with Will Gollop (photo to follow), George Tracey (likewise) and the icig on the very delicious rallycross cake was meeting with Petter Solberg. He was gob-smacked that someone had built a model of his favourite rallycross car ever. I'll be getting some pictures of the car's interior to get that spot on before building a model for Petter himself - by Royal Commission! There are likely to be more models of his cars for me to build for him. I'm a lucky chappie!! And so is he! Thanks again, Chris, Chris and Paul - did you notice the DRM flyers next to the display cabinet??? Here GeorgeTracey inspects Steves model of his Metrop 6R4. George still owns all his old Rallycross cars and hopes to be out in the Group B series next year. Nice waistcoat. Shooters and motors for the rallycross set? All adds to the spectacle, Paul! George was a lovely chap. Hadn't met him before. A real gentle man. Didn't know before meeting him that George had bought the 6R4 from Dermot Carnegie. 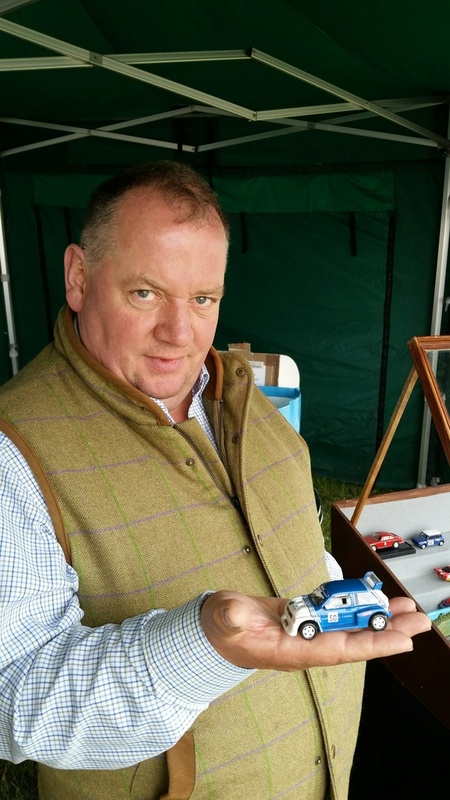 We discussed liveries for the Martin Schanche Group B Trophy, whihc launches next year. George was wondering whether to change the car back to Dermot's colour scheme or not. I asked if Dermot was likely to return to the sport and therefore want to use his livery, but it sounds unlikely. Overall, I believe George will be staying with his own colours, the blue with white and stripes.